Tofu is basically coagulated and pressed milk of soy. 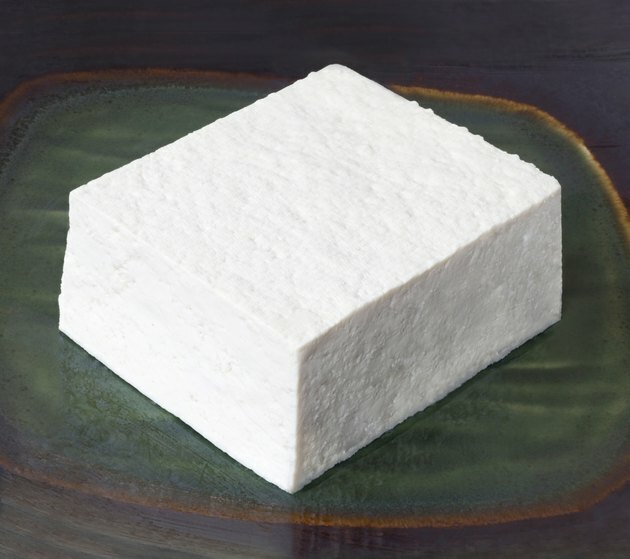 Many varieties of tofu exist, including soft, firm pressed and silken tofu. Silken tofu has less soy and greater water content and is more fragile than either soft or firm tofu, and is usually used in salads and soups. It looks like soft custard and has a creamy texture. You cannot stir-fry it, as it will disintegrate. It becomes firmer as it is pressed. It’s more difficult to cook with silken tofu than with the firmer varieties. Press 1 lb. silken tofu with your hands to mold it into a firm, solid form. Cut it into cubes about 1 inch thick. Place the tofu cubes on a kitchen towel and cover the cubes. Place a flat plate on top of the tofu and put a weight on the plate. Distribute the pressure evenly throughout the plate. Let this set for one to two hours. Place a pan on medium heat and add ½ cup of vegetable oil. Add the tofu cubes and turn periodically with a spatula, every three to four minutes, until they are all golden brown. Place the tofu on paper towels after cooking to drain away the excess oil. Serve the tofu with 2 oz. of spicy peanut sauce. You can also stir-fry the tofu along with vegetables, such as onions, bell peppers and carrots.